One set of grooves on Phobos are thought to be stress fractures resulting from the tidal pull of Mars. The new study, published this month in Nature Communications, addresses another set of grooves that do not fit that explanation. Phobos is an unusual satellite, orbiting closer to its planet than any other moon in the solar system, with an orbital period of just seven hours. Small and heavily cratered, with a lumpy non-spherical shape, it is only 9,000 kilometers from the surface of Mars (the distance from San Francisco to New York and back) and is slowly spiraling inward toward the planet. Since the first detailed images were obtained in the 1970’s, there have been many suggestions for how Phobos got its grooves, but none of them have been able to explain all the different orientations and structures of Phobos’ crater chains. When a small meteoroid strikes Phobos, forming an impact crater, the material ejected from the surface by an impact easily escapes the weak gravity of this moon. This material remains in orbit around Mars, most of it moving either just slower or just faster than the orbital velocity of Phobos. Within a few orbits the material gets recaptured and falls back onto its surface, but not before it has been stretched out into strands. Asphaug, and lead Author Michael Nayak of UC Santa Cruz, developed computer simulations showing how prominent crater chains could result from the debris falling back onto the moon’s surface. The simulations enabled them to track, in precise detail, the fate of the ejected debris. They were able to simulate an impact at the 2.6-kilometer crater “Grildrig,” near the moon’s North Pole, and found that the pattern resulting from ejected debris falling back onto the surface in the model was a very close match to the most prominent actual crater chain observed on Phobos. "A lot of stuff gets kicked up, floats for a couple of orbits, and then gets recollected and falls back in a linear chain, before it has a chance to be pulled apart and disassociated by Mars gravity." Nayak said. "The controlling factor is where the impact occurs, and that determines where the debris falls back." These findings would imply that many of the ~100 m to ~1000 m craters on Phobos could be the result of re-impacts of material ejected from other craters. If that's the case, then the common idea of using the number of craters in a region as a proxy for surface age, could go out the window. 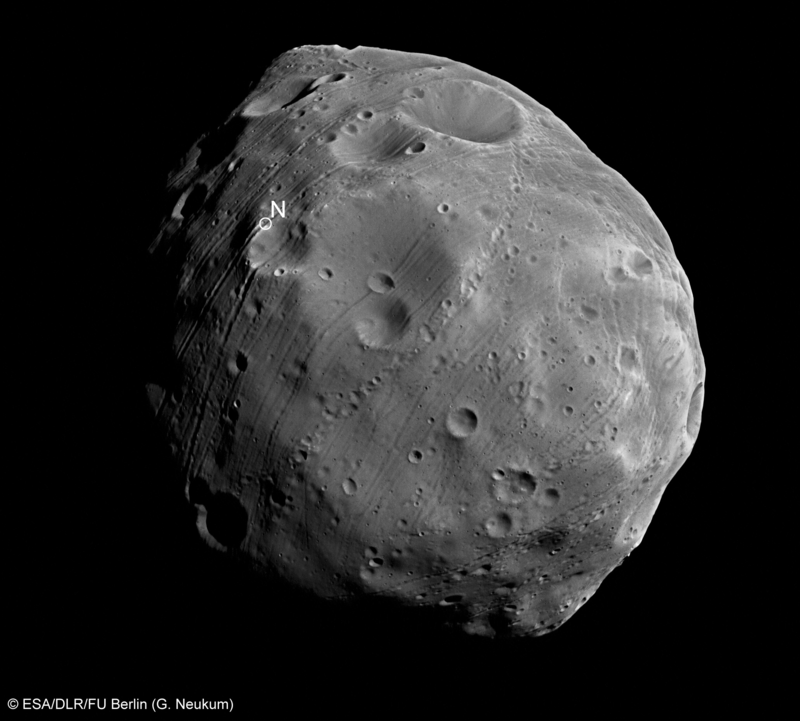 “These findings give us a fresh set of eyes for looking at the geology of Phobos. Most experts think Phobos' surface is around four billion years old, because it is heavily cratered. If so, it formed eons ago and just sat there, being peppered by meteoroids. But if those craters come from Phobos' other craters, then it's quite feasible that the surface could be only tens of millions of years old, continually resurfaced,” said Asphaug. Asphaug suggests that Deimos, the more distant moon, would be a more boring, but more suitable, stopping point. This work was supported by NASA and the Department of Defense through the NDSEG fellowship.